Hello all, Jerm here with some important Tampa Bay dining news for you guys. So yesterday I had a working lunch over at Maggiano&apos;s, which is located over at Westshore Mall, in the Westshore District of Tampa Bay. It had been a while since I had been there, at least 4 years and had no clue what was good on the menu anymore, or what I was going to eat. Plus, seeing as how i am on a strict lunch budget, it was going to be difficult not to order everything on the menu so I had to be careful with the old wallet you know! Luckily our waitress pointed out to me a new special for lunch that Maggiano&apos;s was doing that at the time, seemed a little bit too good to be true. Just to call her bluff, I tried it out though. What&apos;s the deal you ask...well let me tell you! Maggiano&apos;s has taken the two-for-one special and added a little twist to it. With the purchase of one $12.95 entree, the casual-dining units will package another of seven offerings to go as a meal for later. 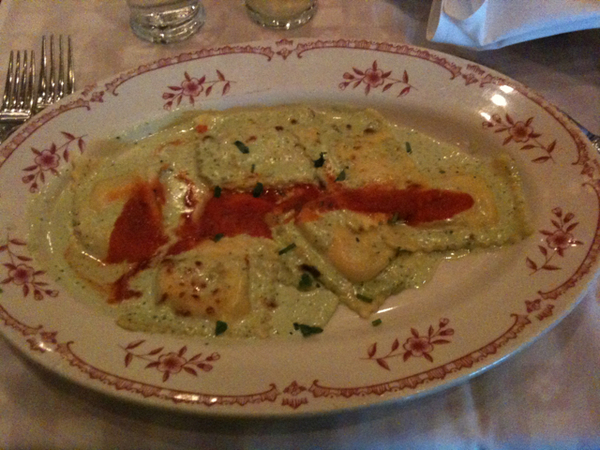 So for me, I had the Four Cheese Ravioli (picture above), and for my second item, which would more than likely be dinner that evening, or lunch the next. These are good portions as well guys, because Jerm couldn&apos;t even finish his Ravioli at one sitting yesterday, so that ended up being my dinner, along with a PB&J sandwich. As I speak, "Mom&apos;s Lasagna," which was my second order is sitting mighty fine in the fridge right now waiting for me to devour it around noon today. If I can remember, I will be sure to take a pic or two and post it on Twitter for you guys to druel over. All kidding aside, in addition to the food being deeeeeeeeeeeelicious, this is a great deal guys, so be sure and take advantage of it as often as you can! And when you get there, be sure to tell&apos;em Jerm sent you! In the meantime gang, check back for more things to do in Tampa Bay!